We have adopted two beautiful daughters, and we’re currently hoping for a third child through adoption. We know all about enduring wait and frustration—but we also know that we can get through it for our growing family. Adoption is hard. Really, really hard—but it was a journey impossible for us NOT to take on. Adoption to us is family, love, joy, loss, and everything we hold dear. Adoption was never a second choice for us. Actually, it was never even a choice. It was always just THE WAY WE WOULD BE PARENTS. There were no fertility treatments, no tears after being told “you can never have biological kids,” no devastation or grieving for the loss of that idea. Adoption is, and always was, my path to motherhood. Can I have biological children? No. Since a childhood illness left me unable to carry my own child, I have always known I would be an Adoptive Mama. Just like our kids will always know they were adopted, I always knew I would be adopting. We have the amazing gift of being able to say, “We are adoptive parents twice over.” We are well aware that couples wait YEARS to adopt, so sometimes it is hard to say, “We adopted independently twice in three years.” We know the rarity of that. However, we also know firsthand the frustration and sense of desperation that the adoption process entails. As we currently endure the wait and hope to adopt our third blessing, we face the months of waiting and the false connections and feelings of intense frustration. But that is not why I am writing this story. I want to focus on our success and the joy that the adoption process has been for us—and can be for you, too. My mind had no idea how to compartmentalize what had just happened as my heart pounded away in my chest. Only one month into our “wait,” we had received the call that would forever set into motion the rest of our lives. 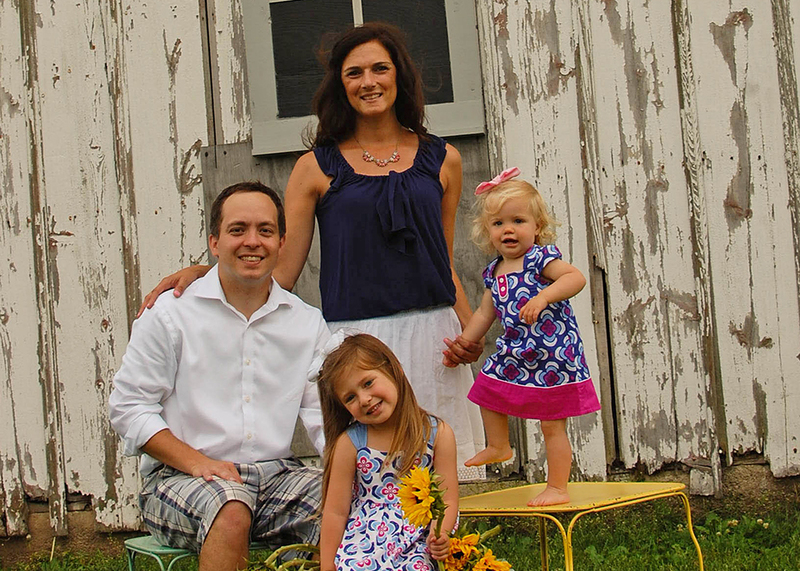 In the summer of 2011, after being married for a few years, we decided we were ready to jump head first into the world of adoption, and it has been a whirlwind of emotions and life experiences since then. We zoomed through the mountains of paperwork, classes, and social worker visits. We received our license in October 2011. As I stood in our kitchen the day before Thanksgiving, my phone rang. There was not a fiber of my being that was anticipating that call to be anything other than a frantic family member in holiday mode. Boy, was I wrong. On the other end of the line was my daughter’s biological aunt. “Are we hoping to adopt? Would we travel to Memphis to meet the birth parents and extended family prior to birth? Are we Christian and God loving? Can we call you later to talk more?” A few minutes on the phone, and that was it. My mind had no idea how to compartmentalize what had just happened as my heart pounded away in my chest. Only one month into our “wait,” we had received the call that would forever set into motion the rest of our lives. After a few weeks and multiple calls and texts later, we took the ten-hour drive to Memphis to meet the birth family. We were transplanted into another world. We found ourselves in a city we didn’t know, with people with didn’t have much in common with. There were moments of silence and moments of connection. Harper’s birth mom was reluctant and stand-offish, while her birth dad was engaging, if not intimidating. There were countless family members all trying to get a read on us as we tried to get a handle on the whirlwind our life had turned into. At the end of the weekend, we went to lunch with just the birth parents. After eating and some light conversation, they stepped outside. A few minutes later, they stepped back in and asked us to be their daughter’s parents. Hugs, tears, and every emotion possible flooded that sub shop. 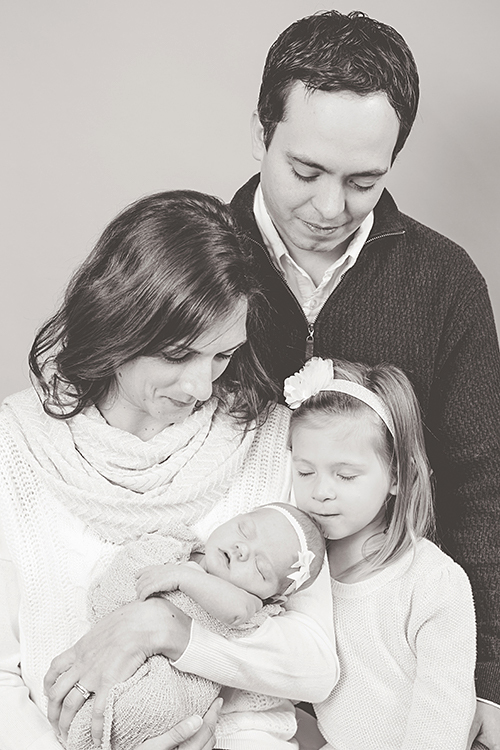 A few weeks later, we found ourselves holding the most beautiful baby girl that the world had ever seen. She is now almost five and is the spunky, loving big sister to our younger daughter, Kaylee. Kaylee’s connection story is somewhat similar to Harper’s. It was quick, heavy on the emotions, and completely out of the blue. The blazing difference in their connection stories is that our agency actually advised us to NOT pursue a connection with Kaylee’s birth mom. In the summer of 2013, after an awful failed adoption, we took a break from trying to grow our family. We were crushed and couldn’t fathom continuing on with adoption, yet we didn’t get rid of a single baby item. Deep down we knew we needed time to heal and adjust to living with that hurt and loss. We were in the process of moving, so it seemed like an ideal time to breathe some new air. After moving into our new home, we felt ready to begin again. We updated our home study. Our social worker said that since we just needed an update, there was no reason to wait to start trying to connect. We were already in the DCFS system, so if something happened quickly, there would be no legal problem. We decided to update our website and try out a site we had heard about called Adoptimist. 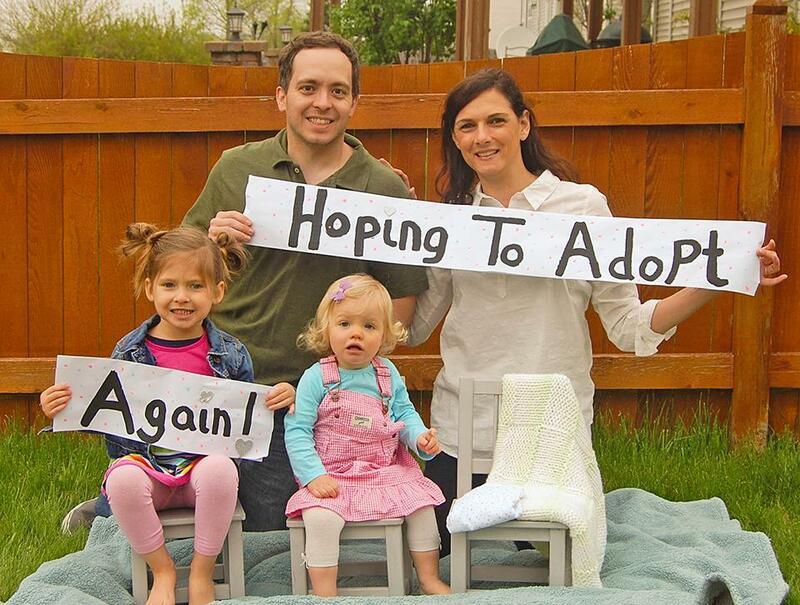 We created our profile, and I thought it would be fun to take some “hoping to adopt” pictures to help us stand out on the site. THAT NIGHT after taking family pictures, on August 20, 2014, we received an email from Kaylee’s birth mom. She had found our profile on Adoptimist and contacted us through the website. The email was long, emotional, and somewhat worrisome. Without going into details, there were red flags, but there was also a tone of honesty and trust in her words. While we felt apprehensive, we have always approached this process with an open heart and mind. One step at a time, one foot in front of the other. So, we responded with a genuine email, and since it was late at night, we decided to head to bed and continue on the next day. The following day, I called our social worker to fill her in on the situation, and the news she gave me left me with a pit in my stomach. She told me that the same woman had sent the exact same email to another couple through Adoptimist the previous night. If there is a red flag in the adoption world, this is probably the biggest. The other couple happened to be working with the same agency as us. What are the odds? Even though the woman had every right to be talking with multiple families, our agency still advised us and the other couple to move on. They said that most likely this was not a situation that would end well. The other couple listened to the agency and did not respond to her. We did not listen. We followed our hearts and continued to exchange lengthy, heartfelt emails and texts. 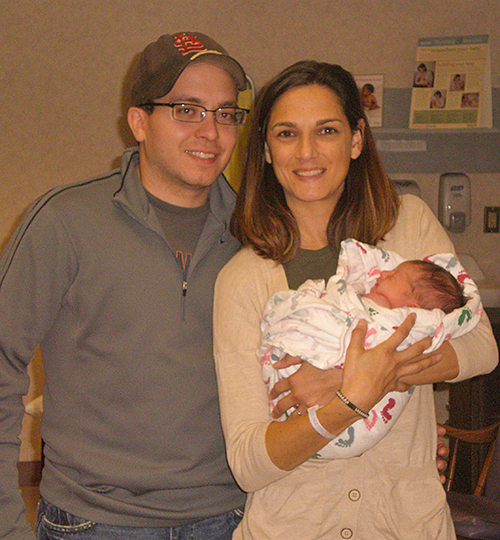 One month later, we loaded up the car to meet the amazing and brave woman who brought our daughter into the world. The meet and greet went so well. Her daughter bonded with Harper, and it felt like a perfect fit. Our daughter’s birth mom is calm, thoughtful, and may be one of the most intelligent people we know. Our daughter was in the world and we were in a children’s museum playing with trucks. No calls, texts, photos—nothing for two days. There are no words for how incredibly hard that wait was. Exactly one month after that meeting, Kaylee Marie was welcomed into the world and our family. We knew her birth mom wanted to be alone with Kaylee at the hospital and that she would call us when she was discharged. We were sent a single picture with her birth stats and nothing else. We knew this was the plan, but Jared had to restrain me from driving to the hospital. It was too hard. Our daughter was in the world and we were in a children’s museum playing with trucks. What a strange mental place to be. No calls, texts, photos—nothing for two days. There are no words for how incredibly hard that wait was. Once again, we found ourselves in a strange city, this time with a two-year old in tow, waiting to meet our new blessing. Thankfully, we were in a safe town with a surprising number of toddler-friendly activities. We toured a museum, walked the Mississippi, and took Harper to her first college visit. We smiled, laughed, and engaged with our toddler, while my husband and I exchanged looks of worry, excitement, and exhaustion. We continued on like that until two days later, when we were called to the hospital to pick up our baby girl. We sat alone with her birth mom as she filled us in on Kaylee. She knew Kaylee more than we did. She had held her for nine months in her belly and three days in her arms, and now she was entrusting us to continue that love and care for Kaylee’s entire life. Kaylee’s birth mom is the strongest person I know, and will ever know. She delivered Kaylee to us, and we are raising her to be just like her birth mom: strong, fierce, loving, and brilliant. Two years after Kaylee’s birth, we now find ourselves sitting at the dinner table, long after the girls are in bed, asking each other if we can continue this journey. We want with all of our hearts to adopt a third child, but we are not alone in this. We have a five- and two-year old who are parts of this, too. The failed connection, the misleading emails, and the sense of feeling incomplete weigh on our shoulders daily. We have chosen to continue on even after the tears and sheer exhaustion because we know it can happen. We can find our baby and missing piece, and so can you. After our experiences, I would tell other hopeful adoptive couples, ignore the noise around you. Take in the advice of what the “experts” say, but then make your own decision. Having five years of experience in the depths of the adoption world, I know that nobody can tell you what is right for your family. Follow your heart and mind. Dive headfirst into every opportunity that feels right and go slowly, but openly. YOU NEVER KNOW UNTIL YOU KNOW. We are sending prayers and hugs out into the universe to all of the expectant moms, birth moms, and hopefully adoptive families. May we all find what we are looking for. Thank you so much for sharing your story. It has really helped me! Thank you. I appreciate you sharing your story.. it really resonated with me.